It’s not often that a series gets a second chance but that’s just what’s happening with the cult favorite show Cupid. Cupid debuted on September 26, 1998 on ABC. 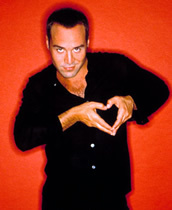 The series starred Jeremy Piven as Trevor Hale, a man who believes that he is the mythological Cupid. As punishment for his arrogance, he’s been sent to Earth by Zeus to connect 100 couples without using his powers. Not surprisingly, he finds himself in an institution and is put under the care of Chicago psychologist Dr. Claire Allen (Paula Marshall). The state mental health board agrees to Trevor’s release providing that Claire continue to monitor his progress, a professional situation made all the more difficult when the two begin to fall for one another. Cupid was one of the early projects by writer Rob Thomas who went on to create the very popular (yet ratings-challenged) Veronica Mars. Though Cupid was cancelled after only 15 episodes (one of those left unaired), the series attracted a small but devoted group of fans. They’re likely going to be very happy to hear that Cupid is coming back, albeit in a new form. For the original series, Thomas admits that he hadn’t fully decided if Trevor was indeed the mythological character. Though he’s not sharing secrets this time around, Thomas says that, if the new Cupid sticks around long enough, viewers won’t be left hanging. “If we make it into syndication, this time I promise that I’ll answer the question.” Stay tuned! hello, my name is Genevieve and I’m french. Lucky for me that this show went across the sea to a streaming website. Sorry, didn’t have the choice because a foolish production has decided to stop this great serie. You know what, you are making a terible mistake. People are tired with series talking about murders, investigations, illness… You are the ones on this segment of pretty shows, treating about love with humour and sens, and you blow it on fire? are you crazy or what. France would have been very happy to see this show. too bad!! !